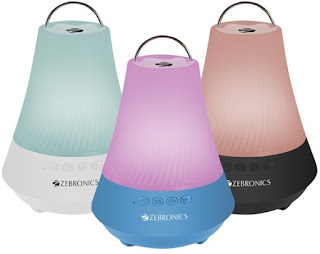 Zebronics India Pvt. Ltd announces another extension to its Audio category with the latest ‘Lamp’ Speaker the perfect confluence of light and music in harmony. Be it your next party, bedside light, while at camping or for long evenings in the garden with friends and family – the Lamp Speaker is designed versatile, suiting every backdrop & occasion. Ergonomically designed in the shape of a lamp or could also be underlined as lantern, the speaker comes in handy with an integrated handle, that makes it easy to carry it around with you wherever you go. Delivering crystal clear sound while elevating the ambience with its dynamic color changing LED lights, Lamp Speaker builds an all-around audio experience. Housed in an optimized acoustic enclosure, the Lamp Speaker delivers sheer loud and impactful audio with its efficient 40mm driver. With the operating range of 10m the ultra portable speaker seamlessly pairs up with mobile or any Bluetooth device whereas its powerful 3W RMS output provides loud and clear music and has uninterrupted music playback time of up to 180 minutes. With the built-in microphone, you can use the Lamp Speaker as a speakerphone with utmost clarity. It’s no sloth when it comes to performance and stamina. The Lamp Speaker delivers powerful sound in a portable package. Aimed at giving you maximum convenience, the LAMP also features a 3.5mm auxiliary port that facilitates you to play music from your flash drive, MP3 player and other gadgets. The speaker also supports several connectivity options which include Mirco SD cards & USB Pendrives. With attractive looks, lightweight design – lets get loud but in style! The product is already available with leading retail stores across India. Logitech Releases Two New Mice! ACER: EXCITING FESTIVE OFFERS WORTH RS.15000!